Helps Fog, Haze, Snow And Bubbles Travel Farther! A versatile product with onboard wireless control and DMX, the AF-5H is a breath of fresh air in the touring, club, theatrical and house of worship markets. 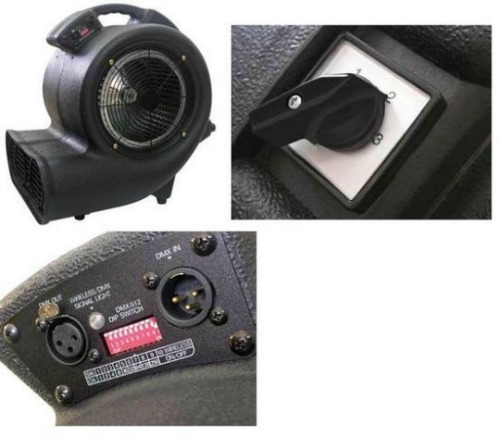 With three different fan speeds, the AF-5H gives designers tight control over the level of wind they introduce to a stage, dance floor or any other setting. Aside from creating the effect of the wind itself, the AF-5 can be used to make fog, haze, snow and bubbles travel farther and higher. Flexible enough to excel in a variety of applications, the AF-5 has an adjustable 45 degree wind angle. The AF-5H really takes fogger effects to the next level. It makes foggers, hazers and other effects much more dramatic, because it not only spreads fog and haze over a wider coverage area, but it also allows you to achieve the coverage you want in much less time. Made of durable polypropylene plastic, the rugged AF-5H is well-suited for touring applications. Yet despite its power and durability, the AF-5 is compact, lightweight and easy to transport. 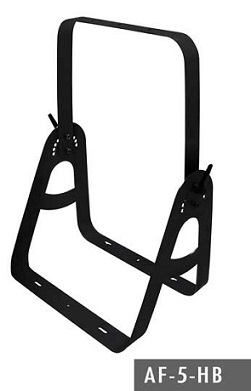 Handy AF-5-HB Hanging/Floor Bracket included at no added cost. Dimension of Vent: 17.87" x 6"